If you’re an entrepreneur who wants to power up your productivity, maximize your profits, and make time for what matters most, this podcast is for you! It’s never been more clear… entrepreneurs are overwhelmed, stressed, out of time, and unable to tackle their daily demands. Sound like you? Dream of growing your business but unsure what next steps to take? Then you’re in the right place. 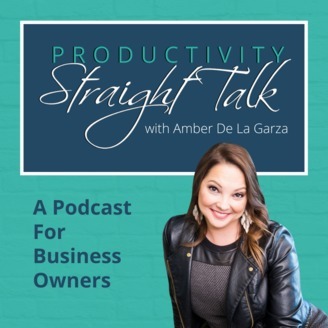 Amber De La Garza, The Productivity Specialist, gives you the straight talk on what it takes to be productive and profitable while creating time for what matters most! In addition to dishing out her own favorite productivity tips, tools, tech, and anecdotes, Amber interviews experts and entrepreneurs just like you about their top productivity techniques, productivity challenges, and how they overcame them to take their business to new levels. 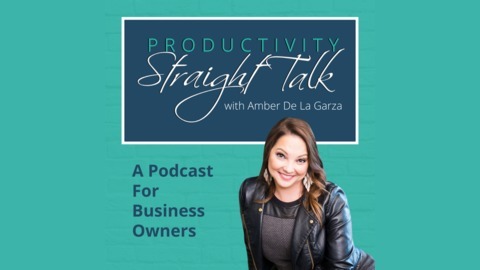 Amber is a sought-after coach, trainer, speaker, and writer who gives entrepreneurs the straight talk on productivity. No B.S., fluff, or over-used jargon. Just actionable strategies to get results and succeed in business! I hope you enjoy my episode on whipping your bottom line into shape and encourage you to create your own system to master your finances. Now let’s jump right in and get to the straight talk!